Posted August 1st, 2017 / filed under Zen West Hollywood. 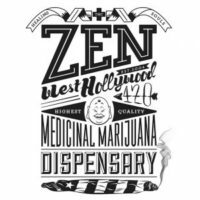 Zen West Hollywood – Located on Santa Monica Blvd & La Cienega Blvd, Zen Healing (Zen West Hollywood) is a proud PRE-ICO medical dispensary that specializes in the highest quality, natural medicine in Southern California. With an ample selection of marijuana strains and edibles, Zen Healing’s mission is to serve the medical marijuana community in a safe, clean, and welcoming environment. Noted as the home of the original medical marijuana machines, Zen healing has evolved with the needs of our patients and the city of West Hollywood to better serve our patrons and the community. In addition, Zen Healing offers free adjacent parking! Stop in today with a valid ID and your medical papers to speak with one of our knowledgeable associates. Ask about our Zen Healing reward card!